Dexter 12" x 2" Left Hand electric complete brake assembly. 7000lb capacity per pair. Mounts with 5 bolts (not included). Uses 12" Hub/Drums. Nuts-38N, bolts-7-5, and washers-38LW sold separately. • Fits standard 7000lb axle with a 5 bolt pattern on the mounting flange. To determine the size of the brake, you need 2 measurements. 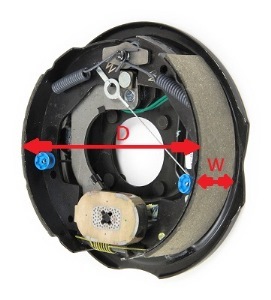 The first is the diameter of the brake(D). The second is the width of the shoe(W). It is good to take note of how many mounting bolts the brake has.